So, you want to see the Kalahari? Are you planning a safari to Botswana? Is Central Kalahari Game Reserve on your list of places to visit? I just returned from a safari to this magnificent country, where I was able to spend a few days in this enormous park. It’s the third-largest national park or reserve in Africa and offers ample wildlife viewing opportunities. I wanted to summarize my experience so that it might be helpful for others when planning their Botswana safari. A big factor for me in selecting CKGR as a safari destination is that its peak season coincides with the low season for the northern parks: the rainy season. The rainy season runs approximately November through the end of April, although this is only an approximation as the rains vary from year to year. When the rains come to the Kalahari, they bring with it a multitude of life. The brown plains turn green and attract herbivores who follow the rains. Herbivores, in turn, bring out predators. This good news for people like me, who try to eschew the crowds and take advantage of off-season prices. I was able to plan a Botswana safari to the northern and central parts of the country at a discount due to the off-season pricing of the northern parks and reserves. I visited the CKGR in mid-January, during the middle of the rainy, or green, season. 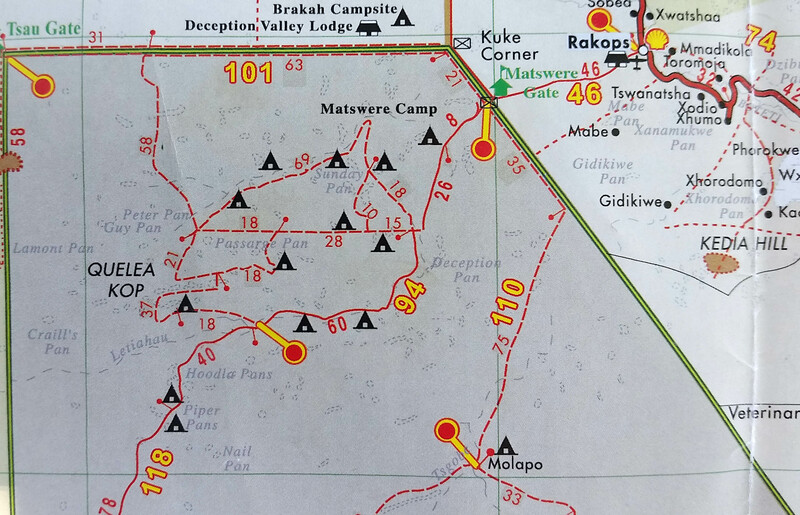 We drove from Maun via the Matswere Gate, to our campsite, which took over 7 hours. Although I could tell by the roads that there had been prior rains, on the day I arrived, the weather was very hot (pushing 40C) and blue skies. Some of the dirt roads were a bit sludgy, but nothing unmanageable. On the first full day of our game drives, we happened upon a cheetah who was thirstily drinking from one of the resulting puddles. We suspected there hadn’t been much rain here the week prior, as the cheetah spent over 15 minutes drinking. He then went on to check out a neighboring herd of impala, many of which had babies—another product of the rainy season. During my time in CKGR, we saw several lions, a few bar-eared fox, jackal, giraffe, one leopard and countless oryx, impala and steenbok. We only saw 3-4 other vehicles in total. It truly felt as if we had the northern part of the park to ourselves, something that really endears me to this place. On the second day, right before our late afternoon game drive was about to commence, the heavens opened. It poured buckets and we waited it out until the rains lessened a bit. This photo was taken when the rains were at about half intensity. The roads instantly turn to rivers and we were driving in at least 15cm / 6 inches of water. It rained that night (you want a good tent if you’re mobile camping), and the following afternoon. Because Central Kalahari is government-run, there are limits on hours of operation. Game drives are only allowed between hours of daylight, which means early morning or night drives are not an option. For this reason, many lodges are located just outside of the park. At present only two lodges are located in CKGR: Kalahari Plains and Tau Pan. Kalahari Plains Camp is owned by Wilderness Safaris and is the most high-end and exclusive camp, with only 8 tents. Tau Pan is owned by Kwando Safaris and offers 9 tents. If you opt to stay at one of these, you’ll do daily game drives with Wilderness or Kwando guides, and share a vehicle with other guests. You have the option to request a private vehicle, which is done at the time of booking. To do this, you are required to pay for each empty seat. Their vehicles hold a maximum of six guests, so if your party were two people, you would need to pay for an additional four people. You must reserve the private vehicle for the duration of your stay. You cannot opt to have a private one day and a shared the next. A huge perk of staying at either lodge is they both use charter flights to transport you from lodge to lodge. This shaves several hours of hot, bumpy and usually boring driving time from your safari. The other option for those who want to stay in the park is to do a mobile camping safari. Most of the campsites are in the northern part of the park, as are the two luxury camps. We stayed in Deception Valley and did most of our drives on the one circuit road. We saw one or two self-drive visitors who were staying at campsites near ours, but we never heard them and only saw them once. Mobile camping in CKGR can be a great or horrific experience, depending on your expectations. If you don’t mind sleeping in a tent in a sleeping bag on a mat, with a pit toilet not 3 meters from your head, then you’ll most likely fall into the former group and love it. If you’re squeamish about scorpions (they come out at night), don’t like the idea of covering your excrement with soil and putting your toilet paper in a bucket, and need a long, hot shower each day, you may wish to stick to the camps. I found the mobile camping to be mostly pleasant and the most authentic bush experience. The hardest part is during the day, when you’re in between game drives. We had nothing to do—no pool to dip in, no fan to lie under, and we would lay in our tent and swelter. Central Kalahari Game Reserve was a highlight of my time in Botswana, and I’m glad I did mobile camping. I would readily recommend this park to anyone who wants to go on a safari and think it’s suitable for those who wish to stay in luxury camping, do mobile safaris or do a self-drive safari. The lack of people and open plains helped me disconnect and focus on the fauna. The only thing I did not like was the long, arduous drives, which, cumulatively, consumed an entire day of safari.